Calcium is the most abundant mineral in the body, with about 99 percent contributing to bone structure. The remaining 1 percent of calcium plays numerous roles, including normal heart rhythm, muscle contraction, nerve transmission, signaling and communication between cells, as well as hormone secretion. Having inadequate calcium or absorption problems in your body increases your risk of osteoporosis, a condition in which the breakdown of bones exceeds formation, causing weak and brittle bones. Keep your bones healthy and support these functions by ingesting adequate amounts of calcium, about 1,000 mg daily for the average adult, according to the Office of Dietary Supplements. Calcium works side by side with vitamin D, a fat soluble vitamin that aids in absorption. 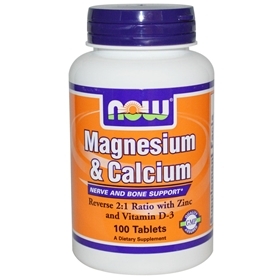 60 percent of the magnesium in your body supports bones, while the rest of it it supports muscle and cell functions. You need adequate magnesium to aid in the absorption and metabolism of calcium, says Dr. Carolyn Dean the Medical Director of the Nutritional Magnesium Association. Magnesium stimulates calcitonin, a hormone that preserves bone structure by pulling calcium out of the blood and back into the bones. Additionally, magnesium helps convert vitamin D into an active form, known as calcitriol, so that it can help your body absorb calcium. Plays a role in relieving symptoms of PMS. Good for adolescents and post-menopausal women. Aids function of nerves and muscles, including regulation of normal heart rhythm. Suggested Use: As a dietary supplement, take 3 tablets daily, preferably with meals or at bedtime. Other Ingredients: Cellulose, Maltodextrin, Stearic Acid, Croscarmellose Sodium, Silica, Magnesium Stearate and Vegetable Coating.